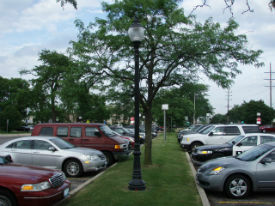 When work begins, it will be necessary to disconnect and remove all existing parking lot lighting in these areas. Temporary lights will be rented to provide a minimum level of lighting for the safe travel of commuters and those who park in the lots in the early mornings and later evening hours. As the new light poles are installed, the lights will be activated. The project is expected to be completed over a period of approximately three weeks. Signs will be posted along Curtiss Street directing pedestrians east to the downtown and commuter station, instead of walking through Village property.